HI Norway encourages our hostels to be sustainable and implement measures that provide increased sustainability, and help their guests to take the responsible and sustainable choice when experiencing our beautiful country. 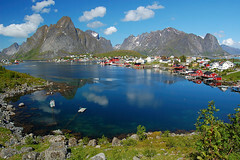 HI Norway is actively working for a sustainable tourism industry. Read more about 10 hostels working in different ways for a greener every day. HI-Q&S is Hostelling International’s quality and sustainability management system that shows the hostel’s commitment to supporting its community, preserving the environment and offering memorable experiences. The HI-Q&S standards are recognized by the Global Sustainable Tourism Council (GSTC). You can start this fantastic hike from HI Molde. At the innermost bank of the Aurlandsfjord, surrounded by steep mountains, thundering waterfalls and narrow valleys, you will find HI Flåm, a HI-Q & S certified hostel and sustainable pioneer. Between the mountains and the lake "Vangsvatnet", in Western Norway, you find one of the most exciting towns in Norway. 2017 was declared as the International Year of Sustainable Tourism for Development by the United Nations General Assembly. Read more about the background for this and our participation.